In his ‘An Essay on Criticism’, Alexander Pope once said that “to err is human”. Yes, we all make mistakes. After all, we are not immortal, divine beings. But if we live around Connecticut’s foliage, trees and shrubs we can’t afford to make a single err when there are mold spores floating to and fro. If you want to live in a home that is “just right” and completely mold-free, continue reading to learn how to avoid the three errs of mold growth. This House is too Moldy! If you are skipping through the woods with your golden locks blowing in the breeze and you traipse on into a home with doors wide open only to discover walls covered in black spots, you better do an about-face and skip on right out. Better yet, you would be wise to call a mold removal company because the homeowner will likely develop respiratory problems or lung disease. When black spots cover walls so predominantly, it is a clear sign that the mold problem has been festering for some time—an err that is unforgivable. These spots could have formed from a pipe burst deep within the walls, or a roof leak could have caused flooding during the last rainstorm. Either way, you don’t ever want to eat porridge in a home crawling with mold spores! This House isn’t Moldy Enough! If you love cheese and yogurt with your porridge but the next house you skip into doesn’t have any, then you are definitely lacking the only good kind of mold out there because, after all, household mold spores spell nasty business and they are best left for the “bad news bears”. When homes suffer from plumbing problems like pipe leaks or a toilet overflow, the homeowners will likely need to arrange for a professional water damage cleanup crew to step in and remediate the situation. Otherwise some deadly mold spores might develop and cause homeowners to get ill and act out like “grumpy bears”. Mold is a serious problem. In fact ABC News reported that a high school in Dublin, CA closed off its gym to students until mold test results came back registering safe. Even an entire athletic program can be shut down if mold is suspected, and therefore you should never settle for any type of mold in your home. This House is Just Right! The only safe house is a mold-free house. Do not let the three errs of mold (aka water damage, humidity and ignorance) threaten your health and home. 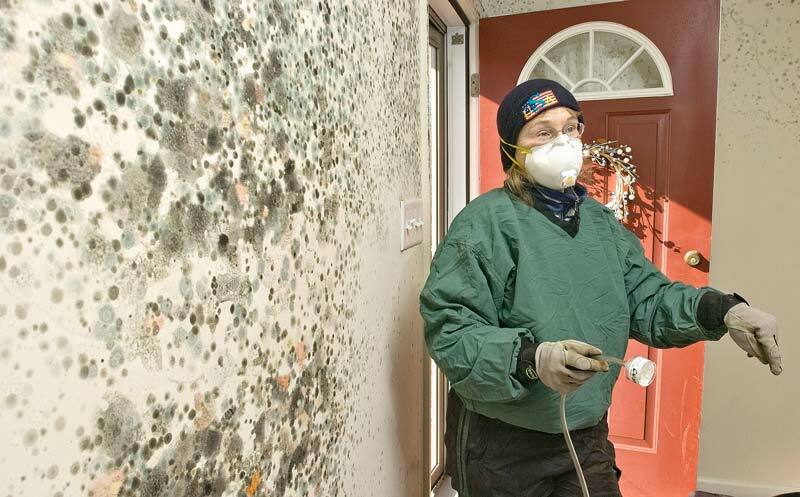 If you don’t have any black spots on your walls but there is a musty odor or a damp sensation in your rooms, you had best call a free mold inspection company immediately, as these are signs that you might have a mold problem. Don’t let Moldy-Locks and the three errs destroy your home. Make sure your plumbing doesn’t leak, your faucets, showerheads and drains are in good working order, and your appliances are functioning as good as new. Invest in a room dehumidifier to ensure moisture and humidity levels are normal. Finally, don’t be foolish; if you don’t perform routine maintenance or have a professional inspect your plumbing and roof, you could be opening the doors for Moldy-Locks to skip on in and mooch off your moisture problem.